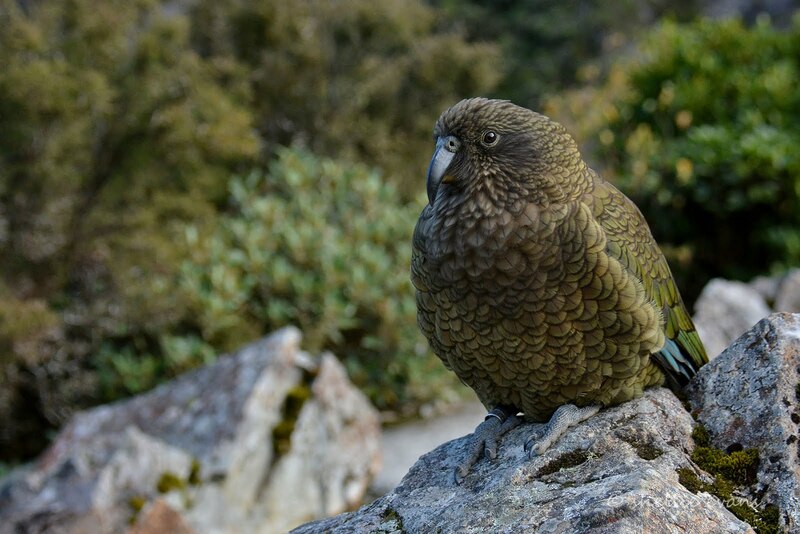 I'm not sure when my next post will be, we're leaving for Okiwi Bay in the Marlborough Sounds today and then we'll spend the next 5-6 weeks exploring the rest of the Sounds. Internet & cell phone reception will be intermittent. I'm hoping that I'll be able to post occasionally as we move between areas otherwise I'll have to do a few day trips out to civilization to keep you up to date. If you haven't already, you can sign up to receive an email whenever I post a blog so you don't miss out on any. There is a "Follow by Email" box out on the right hand side of the blog, you'll get a confirm message once you sign up and then the emails will arrive. Be sure to click through to the blog to read them though, the photos and layout are much better viewed this way. Thanks for your support. Another brilliant day in Nelson, and what a view for the last chore before we leave- Richmond Dump Station. 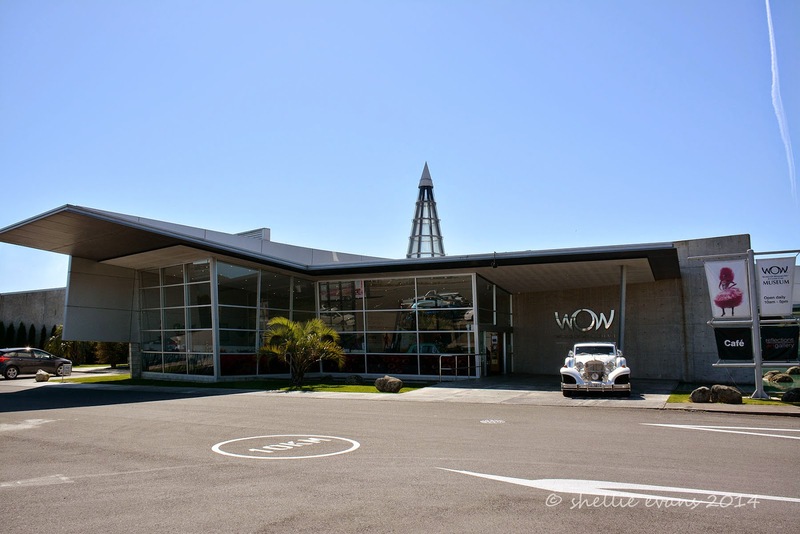 Most New Zealanders will know that WOW stands for World of WearableArt & that the WOW Museum is in Nelson where the original wearable art fashion show started 26 years ago (Correction-it started in Wakefield. Thanks Jimu). 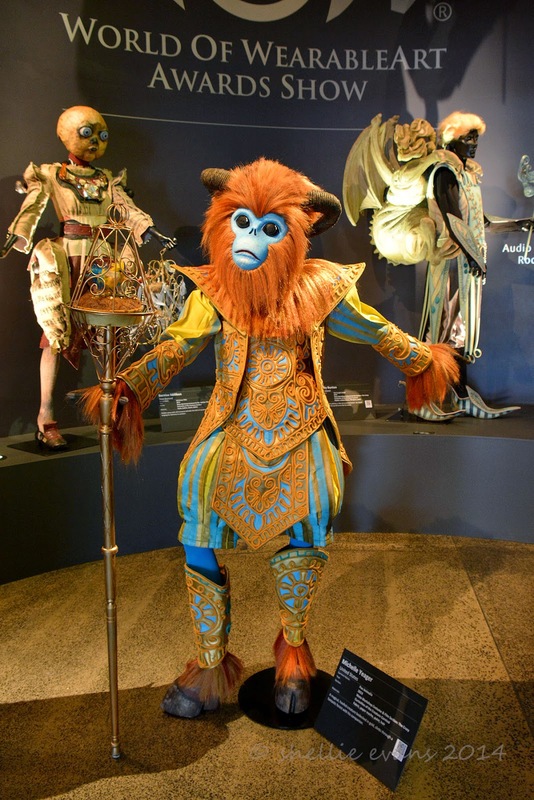 It’s since shifted to Wellington where it has become one of Wellington’s (& New Zealand’s) major events of the year, attracting hundreds of local & international entries and thousands of visitors to the spectacular show. 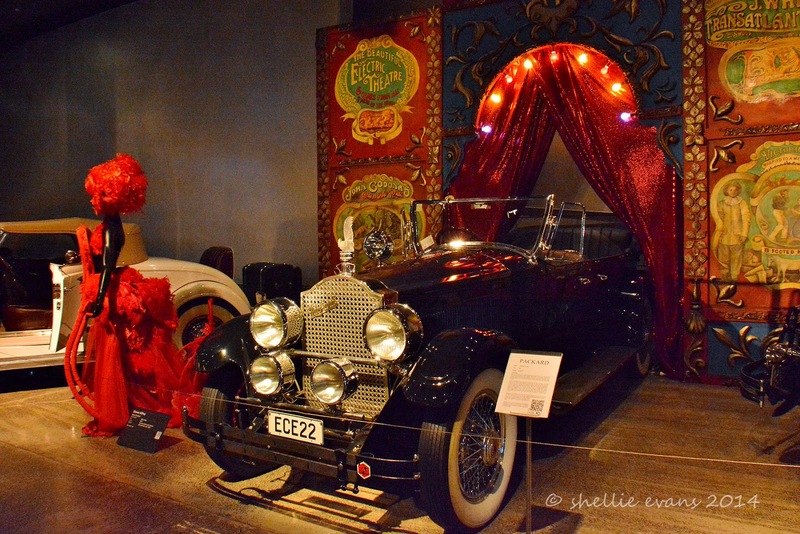 Coincidentally we visited the museum on the eve of this year's show. Below is a selection of some of the garments on display, many of these are past winners in their various categories and some supreme winners. You might notice that some of the photos are a little “noisy”, noise is the digital equivalent of film grain and is caused by a high ISO number (one of the 3 elements that make up the exposure triangle in photography, the others being shutter speed and aperture). ISO is the level of sensitivity of a camera to available light. Higher ISO = more light on the sensor = more noise. 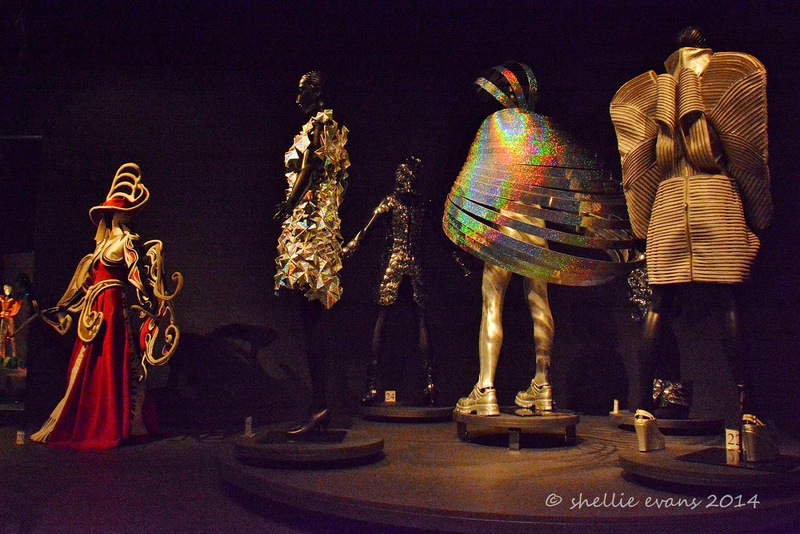 I dialled in far too much ISO for these photos; the display rooms were very dark and I didn’t want to use flash as it’s too harsh but I went a little over board I’m afraid. David says in other words, I cocked up! 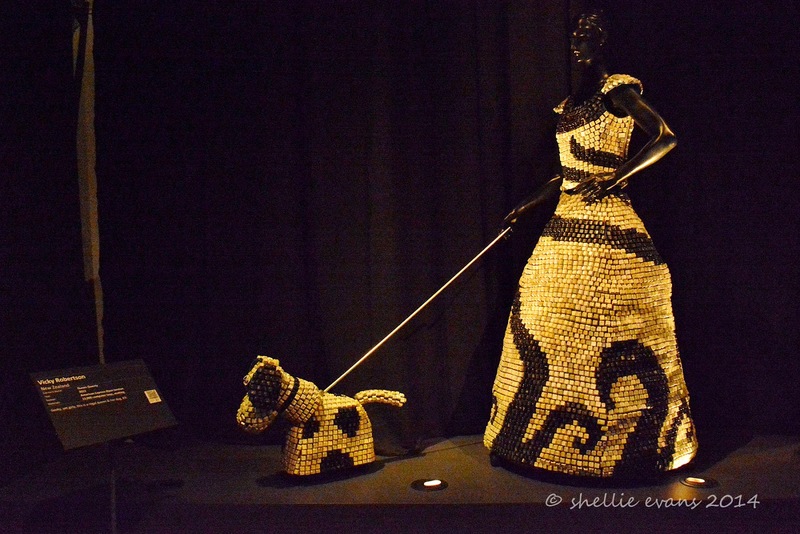 I loved this one, “Ms Qwerty & her friend K9”, the whole dress and dog were made up totally from computer keyboard keys. This trio were a little bit creepy. A “conveyor belt” rotated through the room under the beam of a fabulous light display with about 20 different garments on show (along with an intrepid photographer). 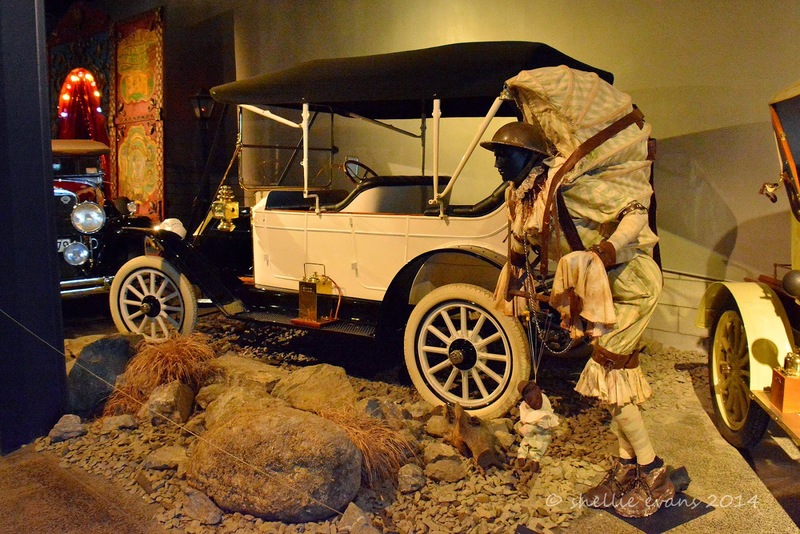 The displays are changed twice a year. 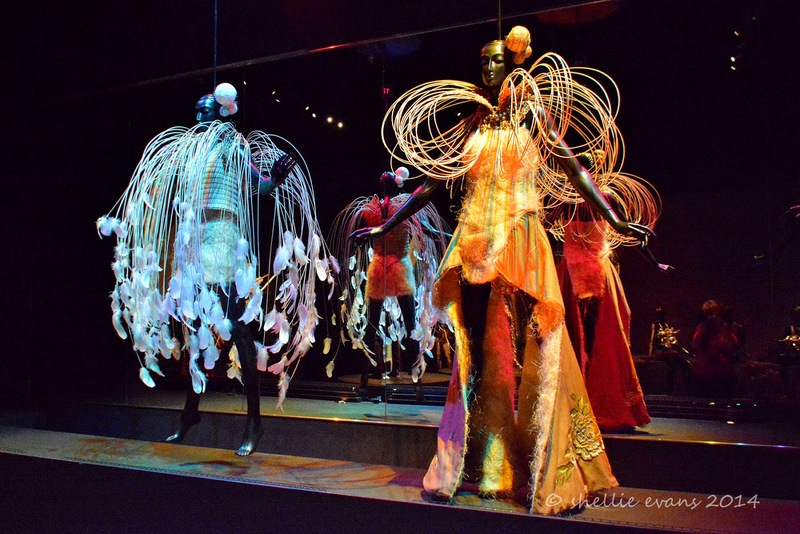 We also enjoyed watching the costumes come alive in the theatre where the actual footage of the WOW show was shown & featured each of the garments on display. Some people have an incredible imagination and are amazingly talented. The light display in the ultra violet & fluro rooms reminded me of the nightclubs of my youth! 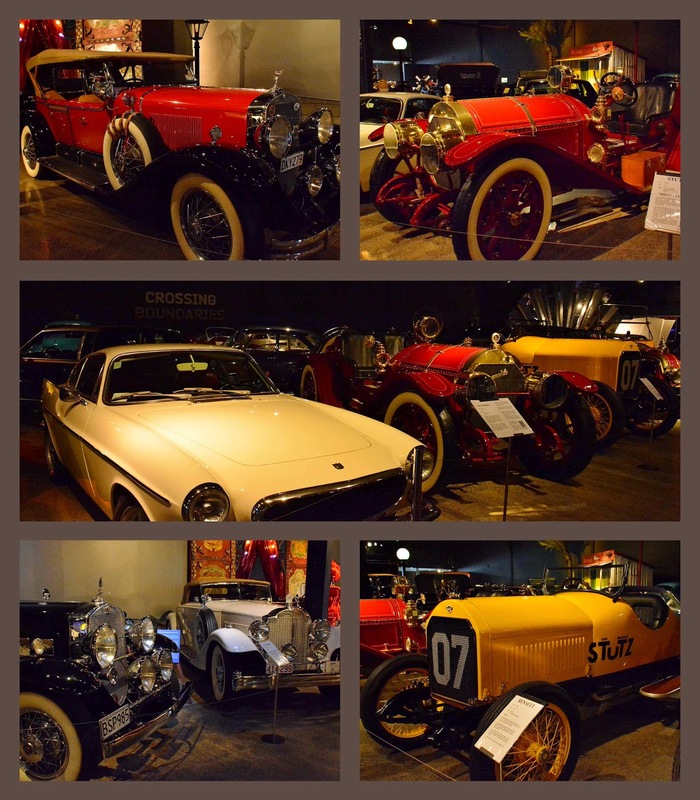 There are also two classic car displays that are part of WOW; the Classic Car Gallery and the Classic Collection. 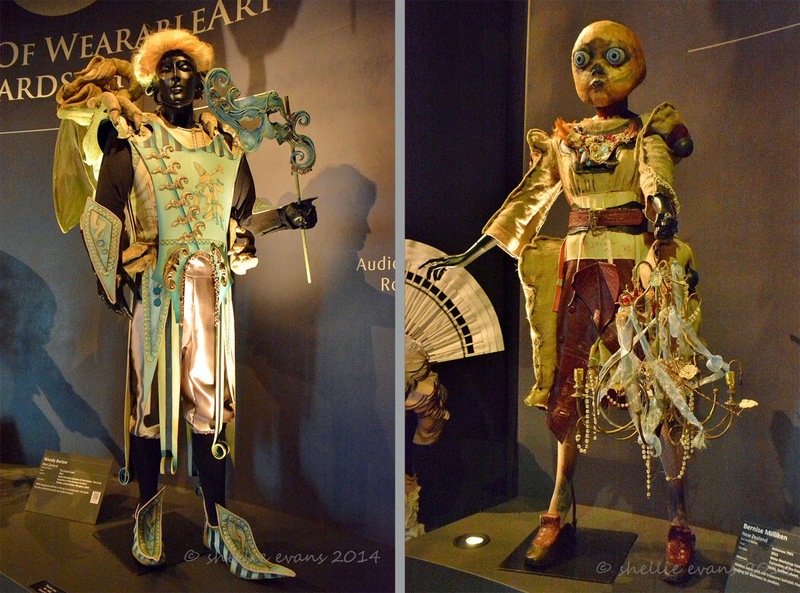 Some of the WearableArt costumes are on display beside the vehicles. 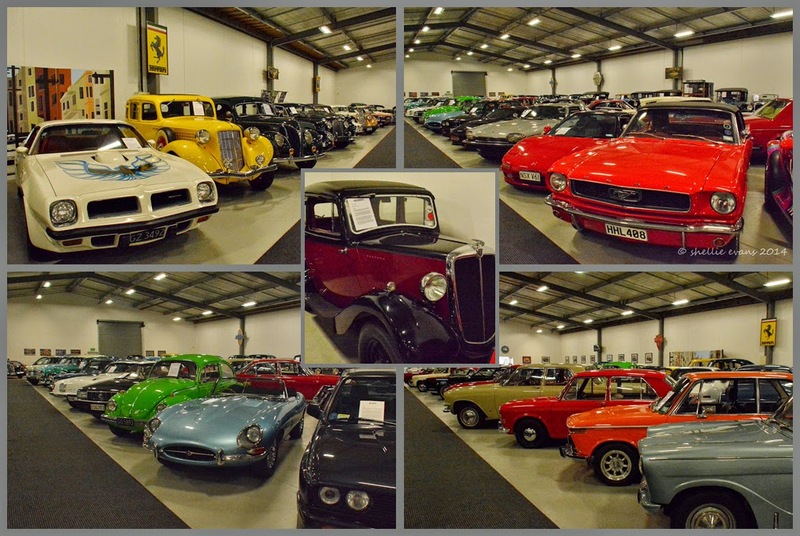 We both thought the layout, lighting & props in the Classic Car Gallery were extremely well done. And talk about shiny cars & perfect paint jobs. Everything was immaculate, not a speck of dust anywhere. 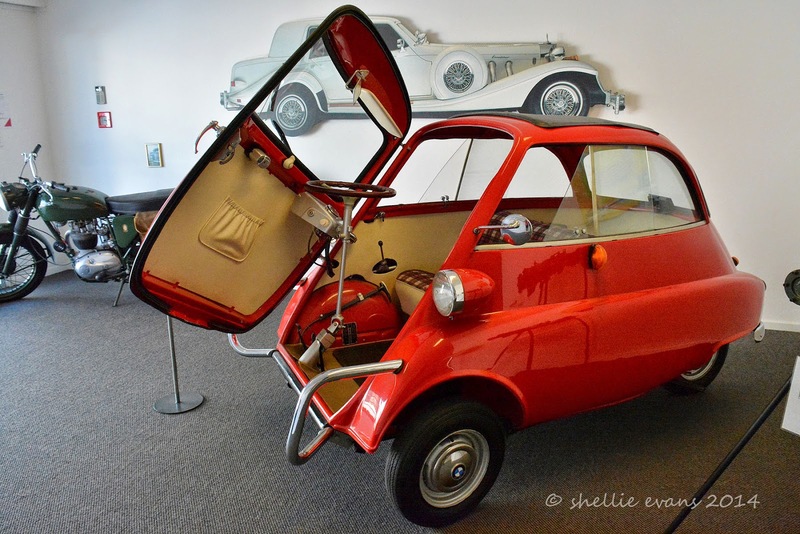 David spent a few minutes reminiscing over this Messerschmitt, a cute little 3 wheel bubble car. 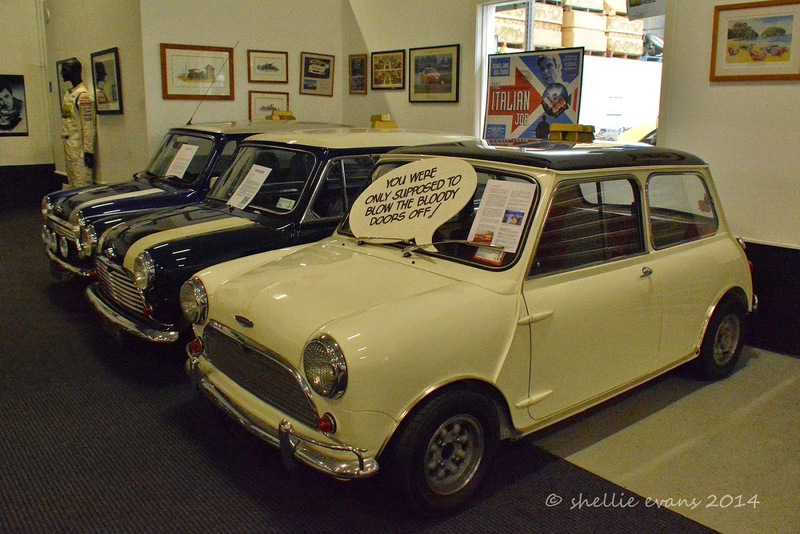 He was once a back seat passenger in one of these (there are only two seats), on a trip from his home town of Orpington, Kent to Hastings in East Sussex, UK. 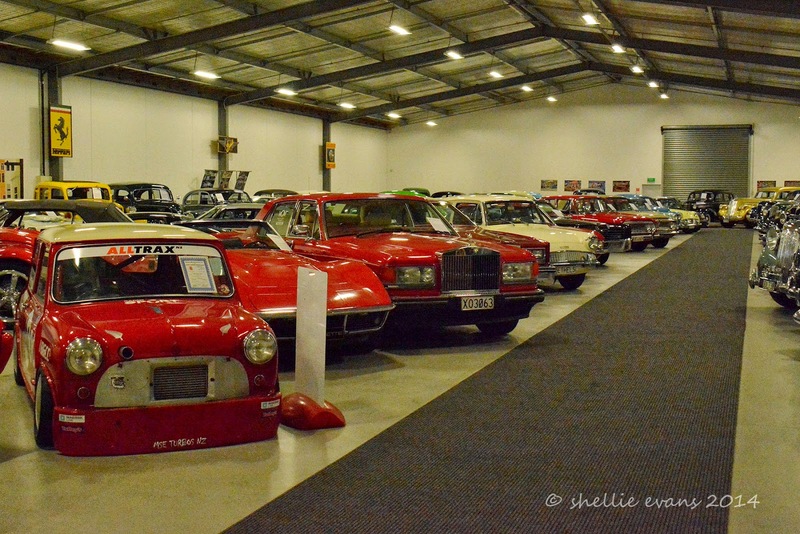 Next was a huge building housing the Classic Collection of cars and what a impressive collection it was. So many familiar models for both of us this time. The car I most desired when I got my license at 15 was a Ford Anglia 105E with the slanted back window. It was the height of cool! But I had to make do with a bright blue Ford Anglia 100E (looks like a Ford Prefect, no slanted back window) and even then I had to share it with Mum & my sister. Well of course I did, Mum & Dad bought it. Mum named it Myrtle after a cantankerous aunt of Dad's. 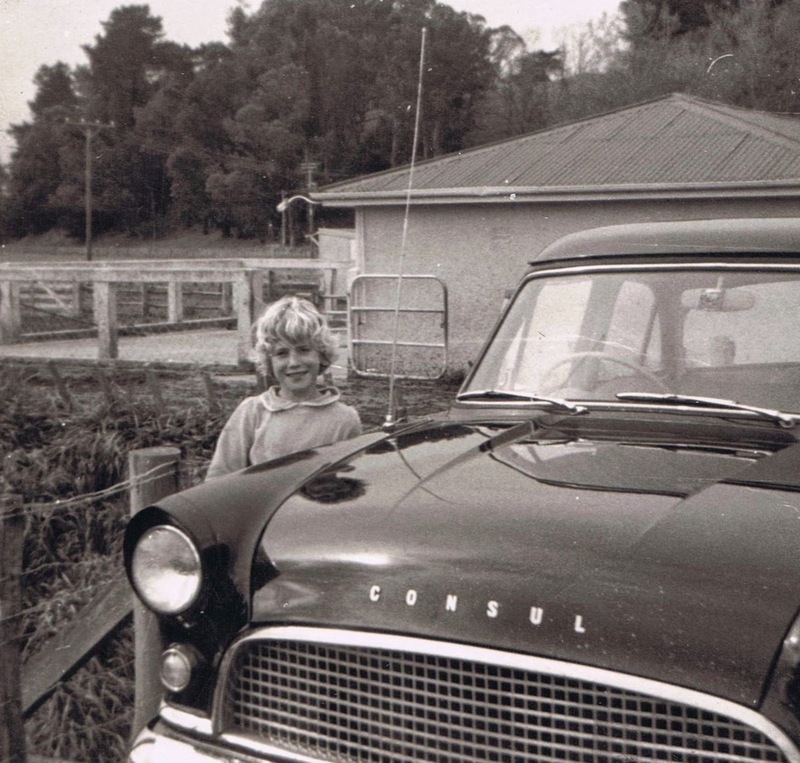 It would seem that we always had the poor brother of the better spec-ed models available, here's me with our black Ford Consul at the cowshed on the farm. When I finally could afford to buy my own car I really wanted a MKlll Zephyr but I ended up with a MkI Cortina instead- champagne tastes with a beer pocket even then! But it did have a racing stripe. I was sad that they didn’t have one on display though, I’m sure they’re a classic. If he could have David would have driven the MKIX Jaguar out the door. This was very nostalgic for him, he had already pointed out at least half a dozen cars he’d owned in the UK and the Jag was the very last one he owned before he moved to NZ. He opened the door (ignoring the Do Not Touch signs) to show me the splendid walnut interior complete with matching fold down picnic tables for the back seat passengers. 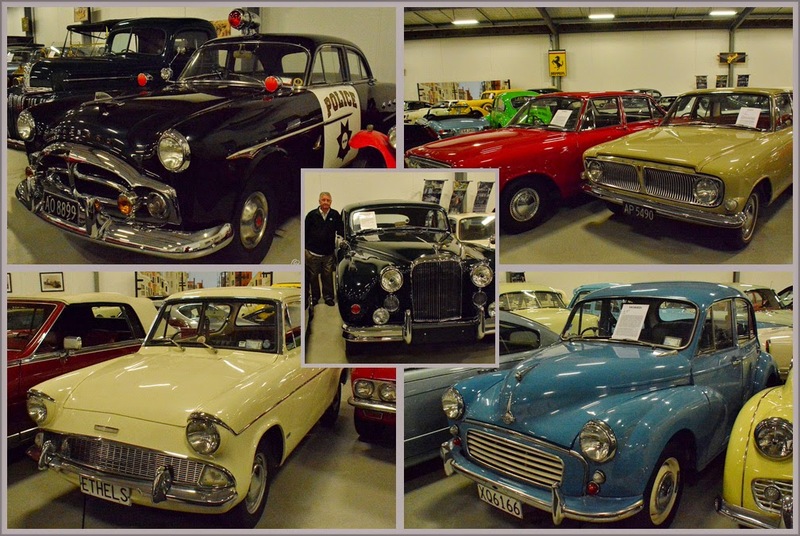 Along with all his UK vehicles there were plenty of others that he’d had dealings with in NZ while he was in the motor trade here. 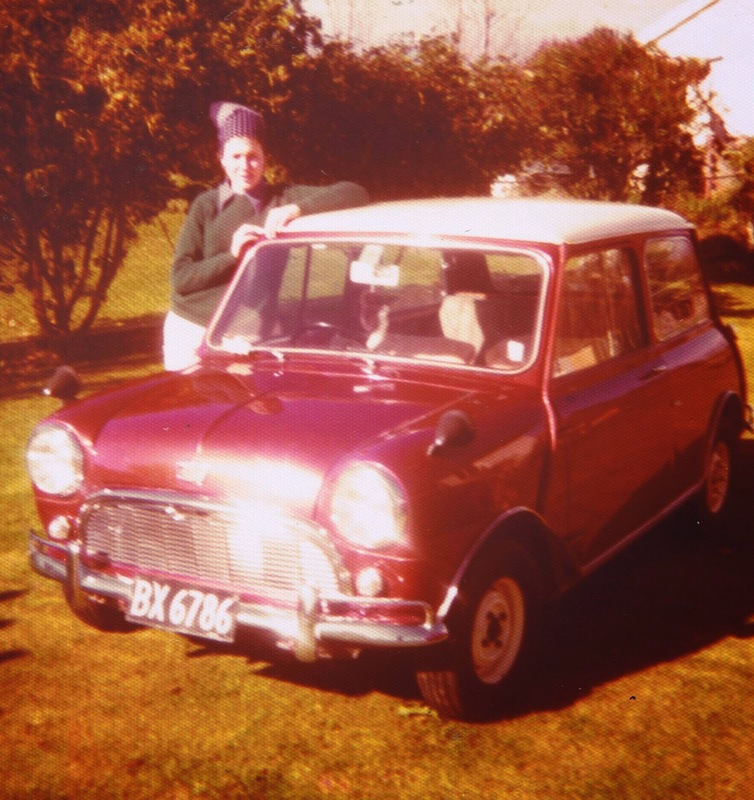 Mum soon made up for the Anglia mistake, the next car we shared was a racy Mini Cooper S.
Love the head scarf. Not! 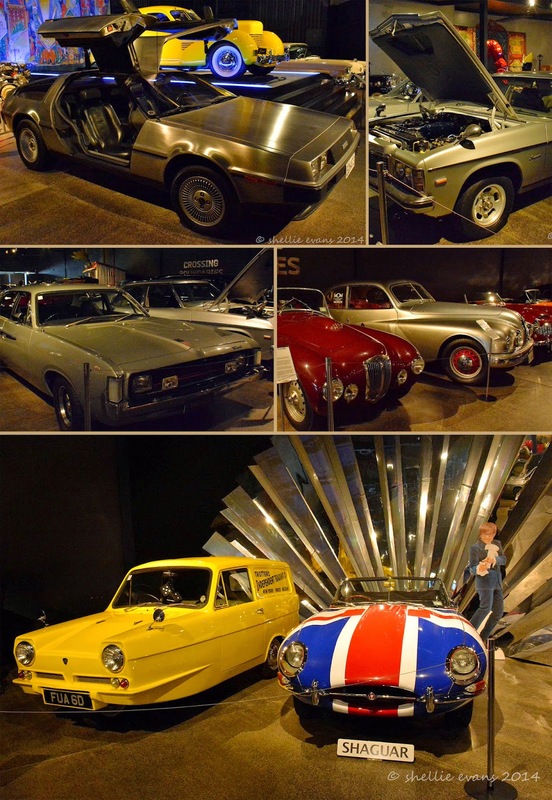 Some of these looked very familiar; Dad’s sister & family had plenty of chunky Vauxhalls & Holdens. My cousins used to collect my sister and I and we’d go swimming at the Tukituki River near Havelock North in Hawkes Bay. Those were the carefree days of endless summers. 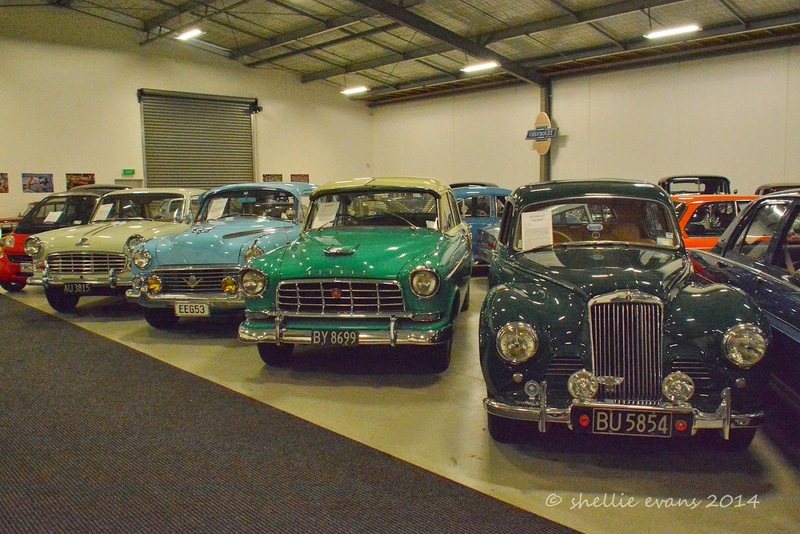 I added the Morris 8 (centre) for Dad, I’m sure it was a Morris 8 that he spent some of his misguided youth in. 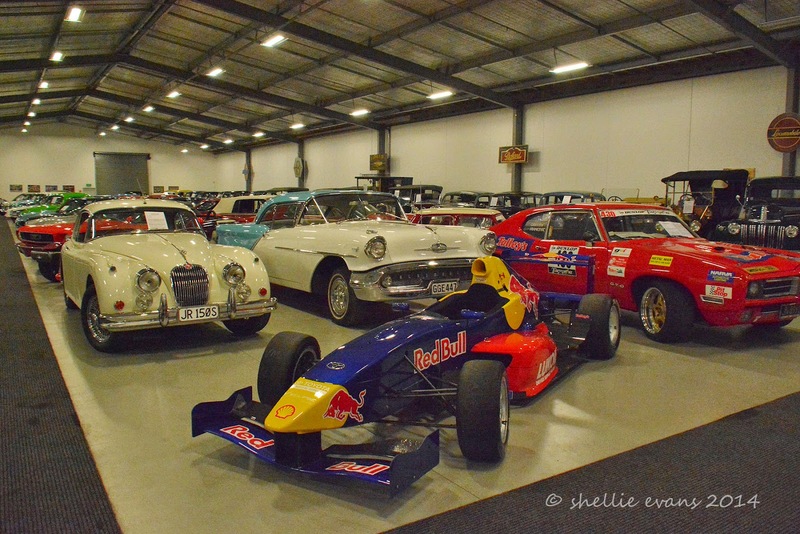 What an awesome collection of cars, we thoroughly enjoyed our trip down memory lane. 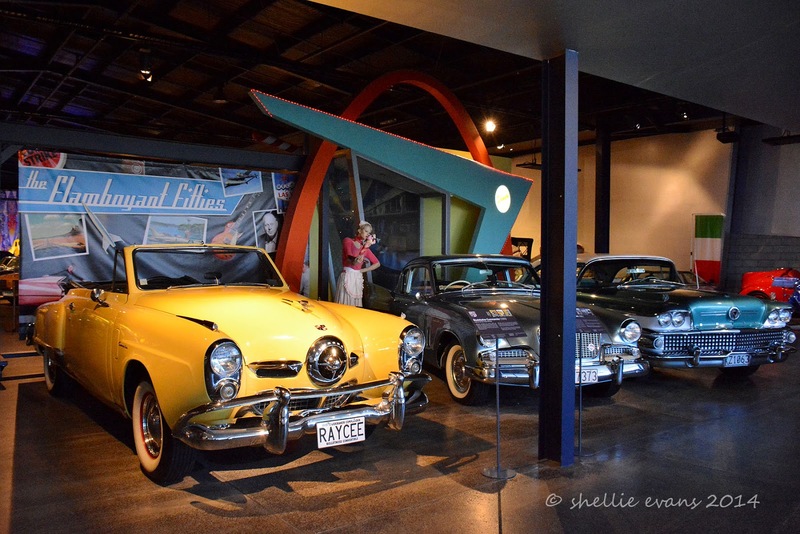 Then it was back through the Classic Gallery with one last display, a very classic & iconic NZ scene. An EJ Holden parked outside the bach/crib (NZ holiday home) with a crate of DB (beer) under the veranda, a tasselled sun umbrella and pukekos on the roof. And a good kiwi “no.8 wire” coathanger aerial. 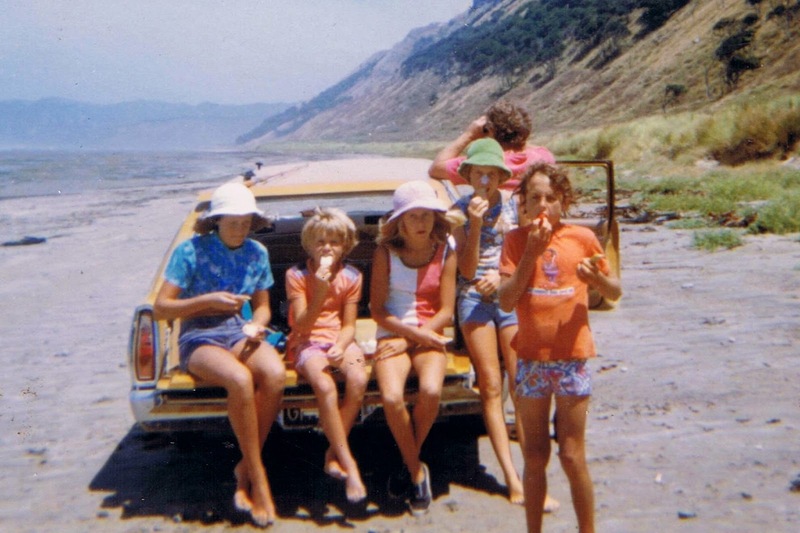 Reminiscent of our summer holidays at a Mahia bach (Northern Hawkes Bay) with our Holden HQ wagon- there's even a fishing rod on the roof. That's me in the fetching green toweling hat and zinc nose! 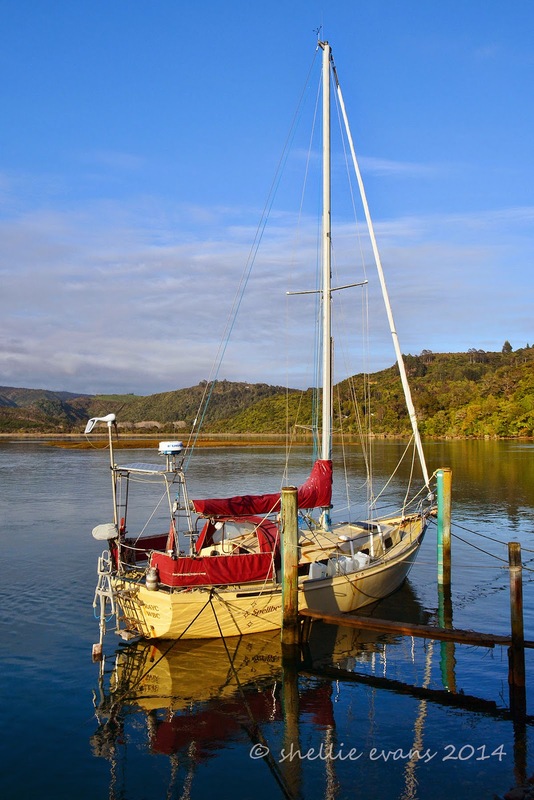 While I was sorting photos for this blog post I can across this lovely one of a yacht berthed in one of the large estuaries between Takaka & Collingwood. I’d stopped there with Diane on our way back from seeing the shags at Tata Beach, the light from the early morning sun and the calm water were just right for a perfect capture. We left Collingwood heading for Motueka where I had a hair appointment booked for early afternoon. I’d had my hair done at Bliss Hair Salon before we left Kaiteriteri & Jo had done such a great job I thought it would be opportune to have it done again on the way back through the town. Finding a good hairdresser when you’re on the road is like finding gold. Crossing back over the “feared” Takaka Hill was problem free although we did meet a little more traffic than last time including a few big truck & trailer units. We took our time and pulled over into one of the many passing bays as soon as traffic appeared behind & at one stage we had to pull up at a narrow section to let an oncoming large truck through. It was slow haul up and just as slow a wind down the other side. 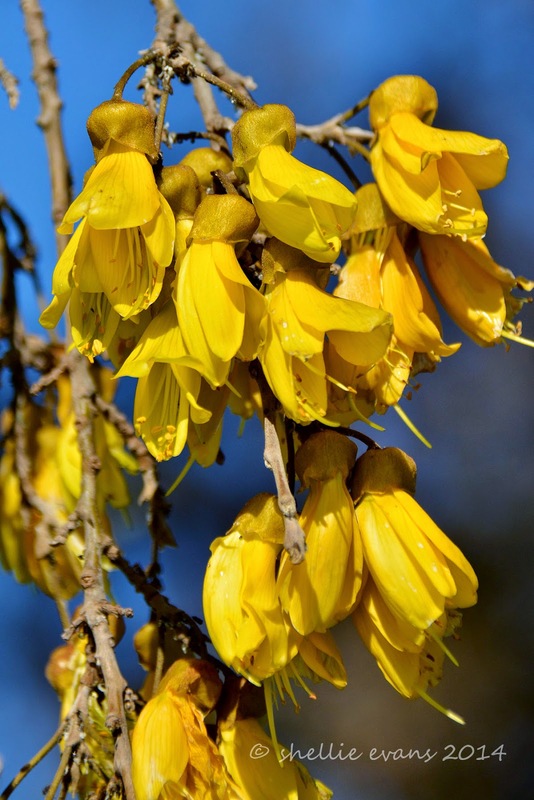 It was great to arrive safe & sound in Riwaka where all the fruit trees were in blossom, gardens full of daffodils and kowhai in flower along the roadside. Spring had arrived while we were in Golden Bay. 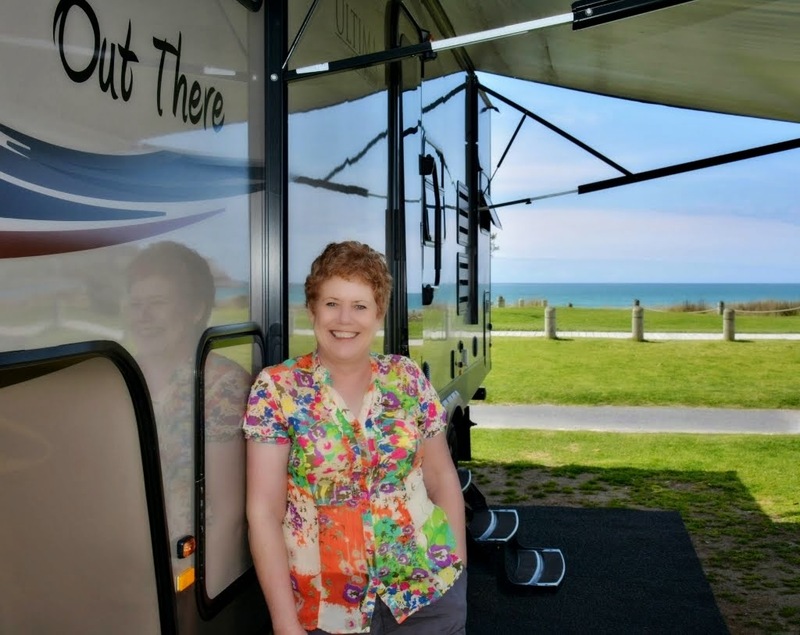 Originally we thought we might head on to Nelson after my appointment but as we’d arrived early we decided to take a look at a freedom camping spot at Port Motueka where you can stay for a maximum of 3 nights. We liked what we saw and with just another 5th-wheeler already in place it looked a good spot to stay overnight. We unhitched and David ran me back into town. 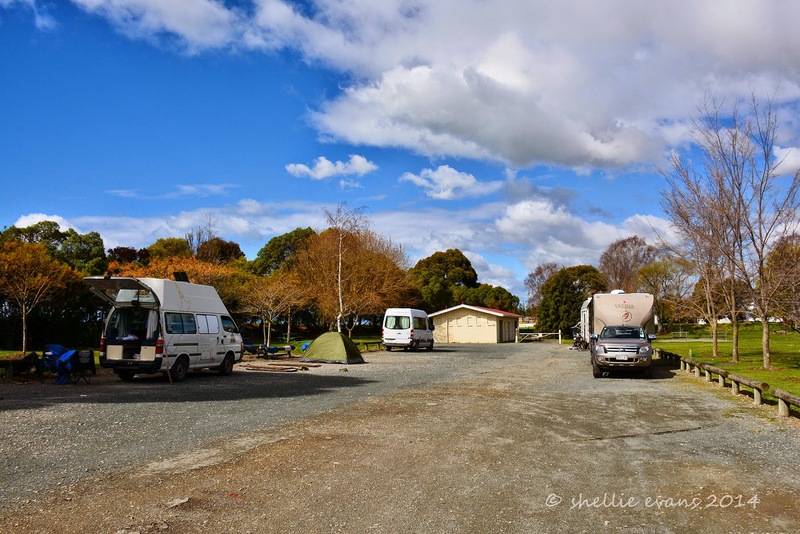 By the time we got back late in the afternoon the car park had another 4 or 5 vans of various shapes & sizes parked up and by night fall there were 11 vehicles and the carpark full. This spot is obviously well known and patronized probably because it's not too far from the Abel Tasman Park. Some of the benefits of our slow travel is the fact that there’s no hurry for us to get on the road when it comes time to leave, we usually only move 50-100kms and in fact today it’s just 33kms to Richmond where we'll stay. 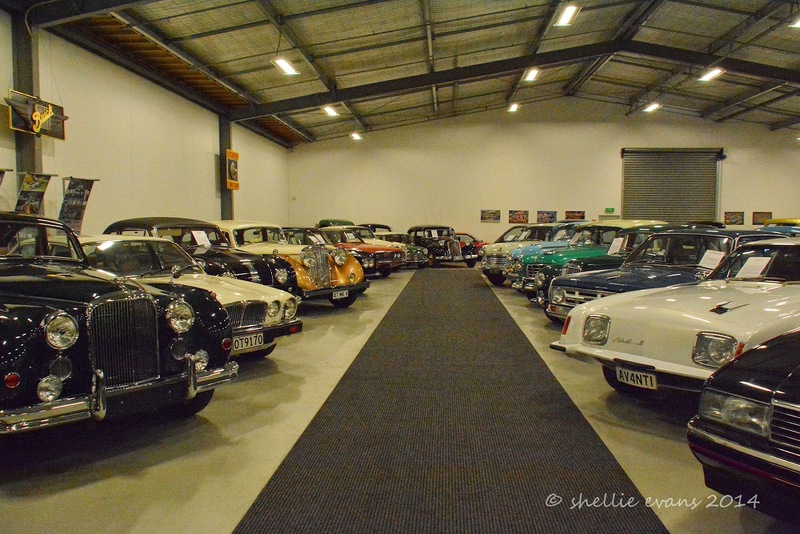 By the time we open our doors in the morning the car park has virtually emptied. Just the two 5th-wheelers and two campervans, one had obviously been somewhere where they’d had torrential rain. It looked like every piece of clothing and camping gear along with the tent was hung out to dry. 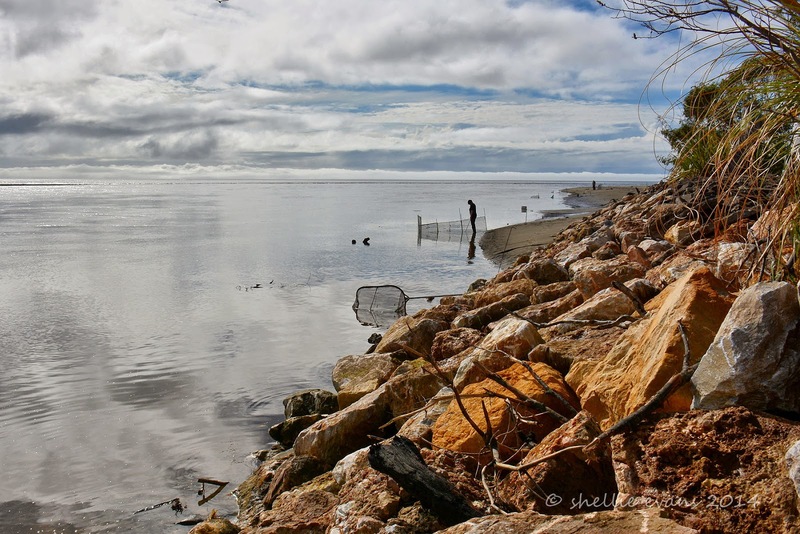 Port Motueka is a lovely area surrounded by those ever present estuaries and huge tidal plains that have become a familiar feature of our visit to the Tasman District. 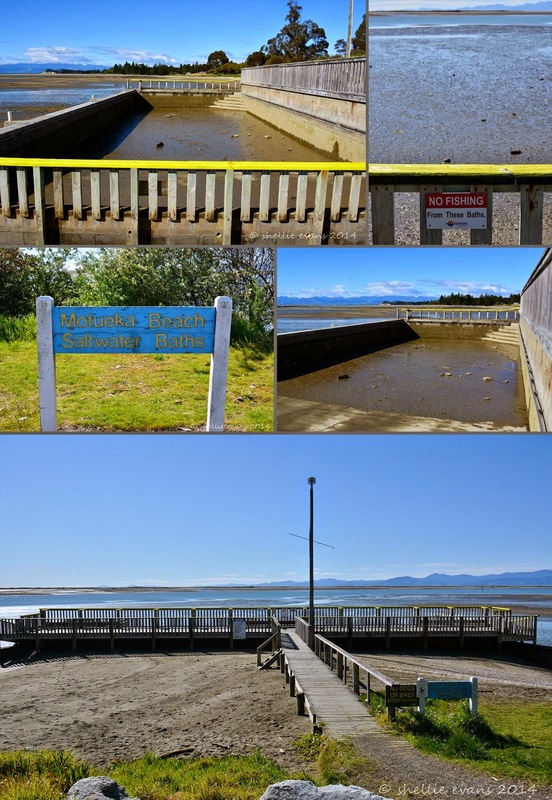 Over the bank on the far side of the carpark is the historic Motueka Saltwater Bath. When I saw a sign further down the road pointing the way to the pool I told David there were pools close by. He asked me if I knew if they were heated or not. I had a laugh when I went for a walk to check them out. This type of pool is now unusual in NZ although they were quite popular at seaside (obviously) towns of yesteryear. The baths were built in 1938 after families camping nearby over summer were concerned about sharks. The pool was renovated in 1992 when the wooden railings, decks & a concrete floor were added; before then it wouldn't have been more than a concrete pit. There is a special gate that lets the incoming tide fill the pool, the pool is hosed down and cleaned every couple of weeks between October and April. I’m not so sure you could do your daily laps here but it certainly would be a good place to cool off over summer. Especially when the tide was out. 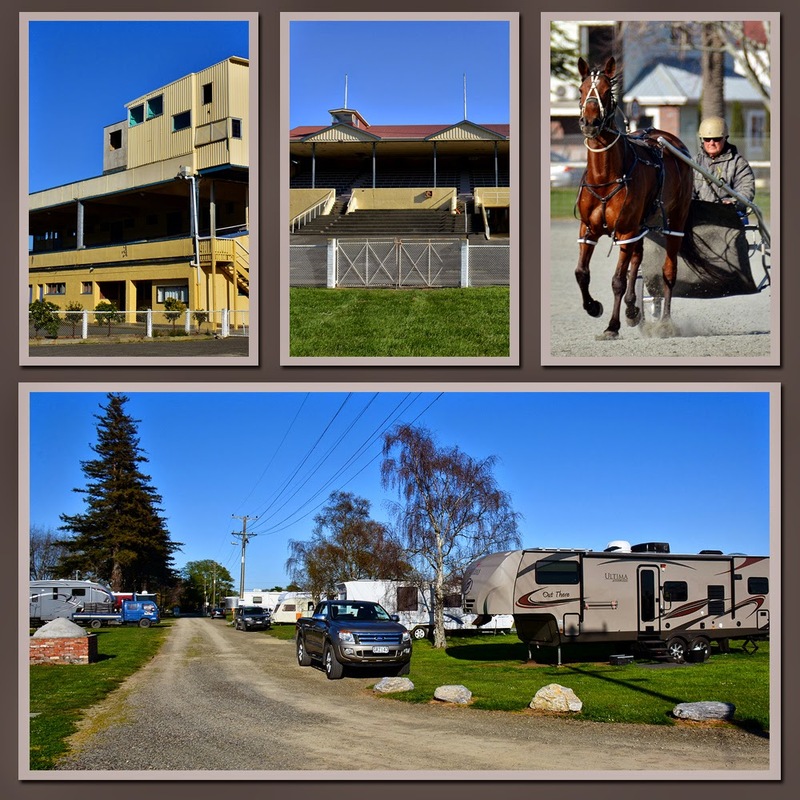 We have now been parked up at the Richmond Racecourse for just over a week, although not a NZMCA Park, the campground is for fully self contained NZMCA members only. 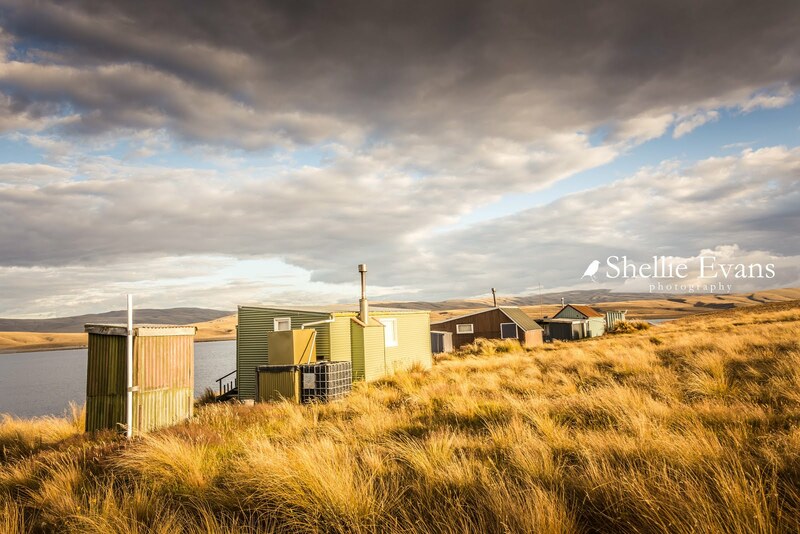 There are toilets and a laundry and a few powered sites (if required) plus a resident camp manager. 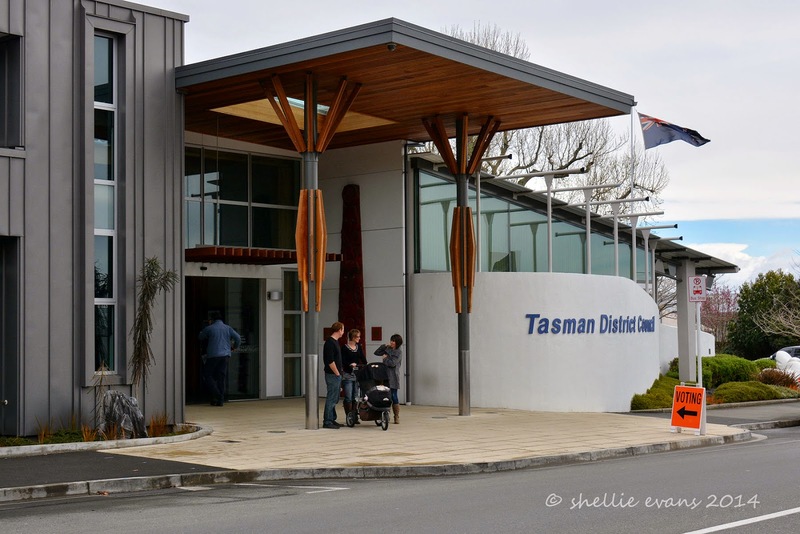 It’s very handy to the Richmond shopping mall and main street and just 15kms from Nelson city centre. We’ve not done, & won’t be doing, too much exploring around Nelson. 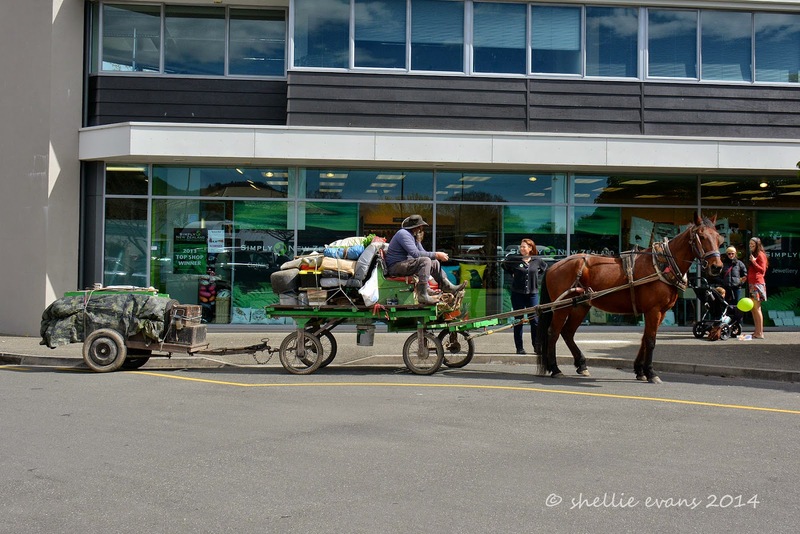 We had a few errands to do in town, have the ute serviced and of course cast our vote last weekend. Casting a special vote had us nearly choosing a candidate from a Maori electorate! We were given the wrong forms to fill in and it was only when I couldn’t see a familiar name on the voting paper that I realised what had happened. Back to the desk and another 15 minutes of filling in forms had us finally with the correct papers. It amazes me that after all we’ve done in making sure our address is correct for all our personal affairs, as in a box number because we have no fixed abode, we still have to have our last known address on the electoral roll. This is just plain silly, ok we’ve only been gone from Tauranga for a year and we know the relevant candidates but what happens in 3, 6 or 12 years time (if we’re still on the road) when we wouldn’t have a clue who our candidates were. It was hard enough recalling our old address when asked this time, let alone in a few years! 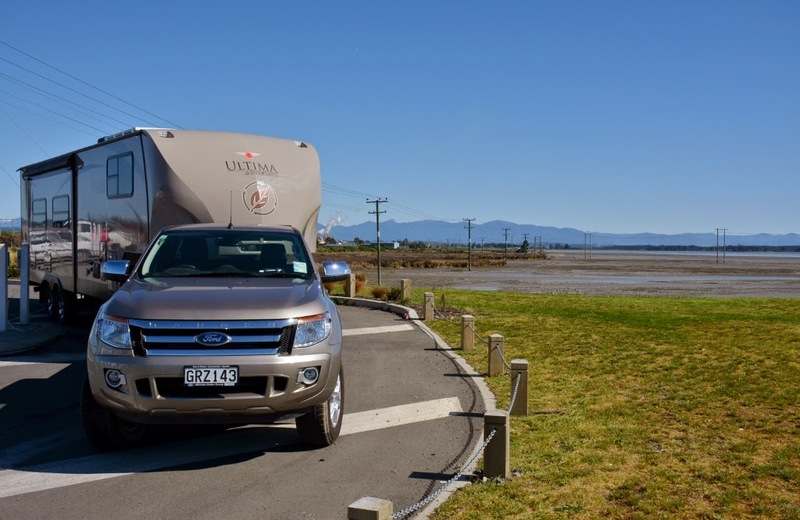 On the weekend we went for a tiki tour along the water front, checking the Tahunanui peninsula out and driving right to the end where we had wonderful views out over more tidal flats to the snow covered mountains beyond. To the right are Mt Arthur and other mountains in Kahurangi National Park which was where we had walked and driven through the snow. We thought we might have been able to complete the walk to Mt Arthur Hut while parked up here in Nelson but a heavy dumping of snow last week has put paid to that. 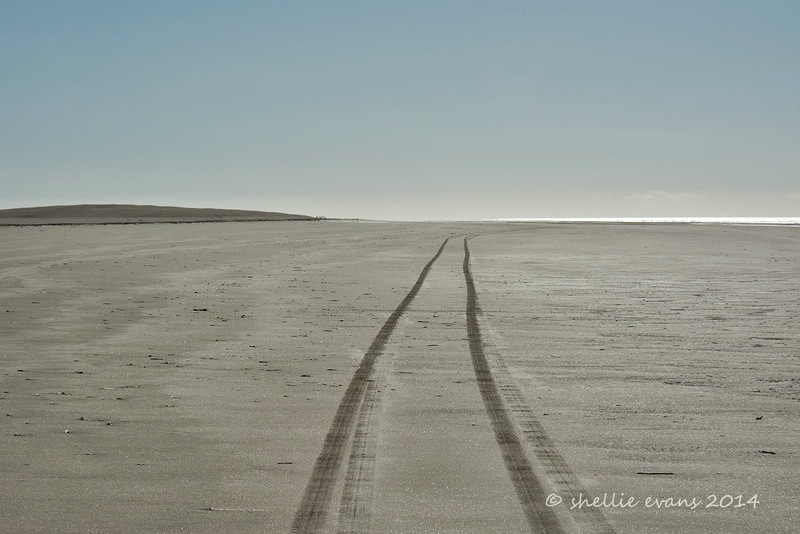 The carparks at the end of the of the sandy track were full of cars and out on the sand in both directions were dozens of people walking. And dogs running. This was obviously a popular dog walking area and being a lovely sunny weekend day everyone was out enjoying it. After a visit to the WOW museum (more on that in another post) we drove along the waterfront, stopping to book dinner at The Boatshed Cafè. We’ve been waiting to stay in Nelson since David’s birthday back in July when the family gave him a dinner voucher for the restaurant. We’re looking forward to sampling the seafood on offer. Another perfect day of spring sunshine and people out enjoying it. Although we did have a blustery day earlier in the week that wasn't much fun. 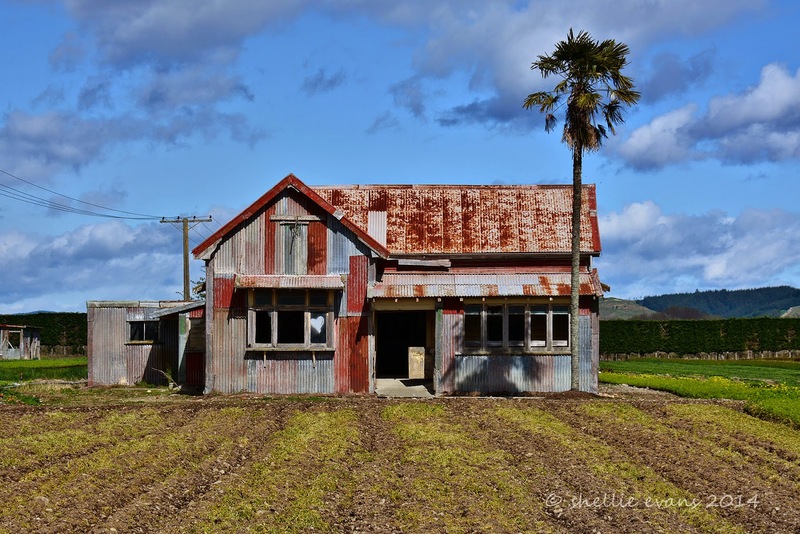 And one last photo, an abandoned farmhouse on the main road into Richmond; perfect fodder for a photographer! After four weeks the time had come to say goodbye to Golden Bay, cheerio to Collingwood and farewell to our new found friends at the Collingwood Camp Ground. Once again we could quite easily have put down some “feeder roots” and settled in for a few more weeks but we must keep this snail’s paced journey on the move otherwise we’ll have to keep adding months to the other end of our ‘grand tour’ of the South Island. We have been spoilt by the weather, glorious golden sunrises, brilliant blue skies and calm settled weather week after week. We came north for winter and the Tasman District has served us well; 4 wonderful weeks in Kaiteriteri, a quiet week in Pohara and 3 fun filled weeks in Collingwood. We've thoroughly enjoyed being honorary members of the whitebait crowd at Collingwood, we loved the camp camaraderie, the friendly banter & partaking in “Happy Hour”. 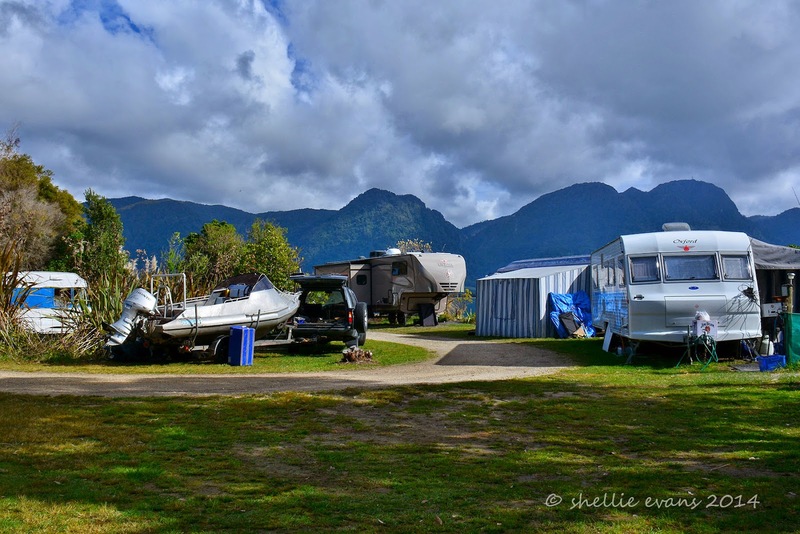 We enjoyed looking on as motorhomes, caravans, cars, boats & trailers, all filled to the gunwales, arrived to set up camp and soon just about every patch of grass was covered with camping & fishing paraphernalia. We watched the daily parade of boats & bikes, nets in all shapes & sizes, rods (for those quiet times) and people dressed in waders passing by our window. We admired the tenacity & passion (or is that obsession) that every whitebaiter possessed no matter the weather or the size of the catch. We loved the camp quiet time, when we had the place to ourselves, when all we could hear were the birds and the gentle lapping of the incoming tide. And then we’d look forward to the first vehicle rumbling back into camp signalling the end of the day’s fishing and the return of the “fleet”, we'd then be keen to hear how everyone did. 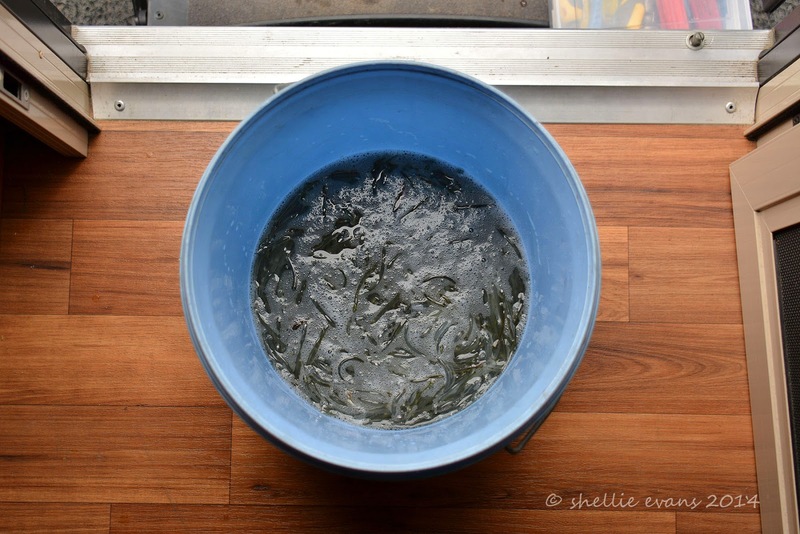 But best of all we enjoyed the precious little whitebait packages that arrived at our door & the secret language that went with any whitebait discussion. We learnt the lingo, “enough for a feed” could have been anything from a dozen fish to half a bucket full! So thankyou Bill & Shelley for your hospitality and accommodating us on a perfect site. 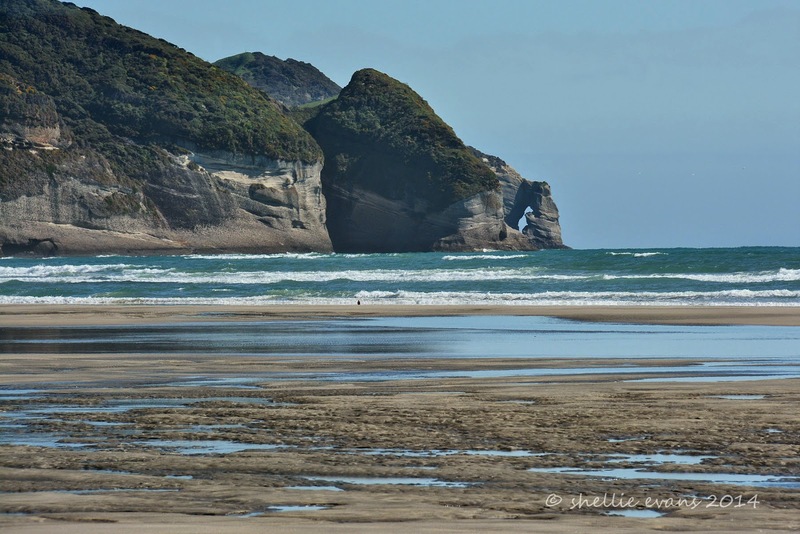 Bill you were right, there was no need to head to Wharariki, the best little camp was in Collingwood! And a big thankyou to Gerald & Pam, Sally & Ian, Diane & Ian, Ken, & last but not least Skin…. (or was that Stretch) for making us feel so welcome. We look forward to our paths crossing again one day. Farewell Spit Eco Tours base at the lighthouse is one of the original lightkeeper's cottages and it’s where we gather on the deck to have our lunch (which we've brought with us) and hot drink & muffin (supplied by the tour company). Then it’s off to explore the surrounding area. 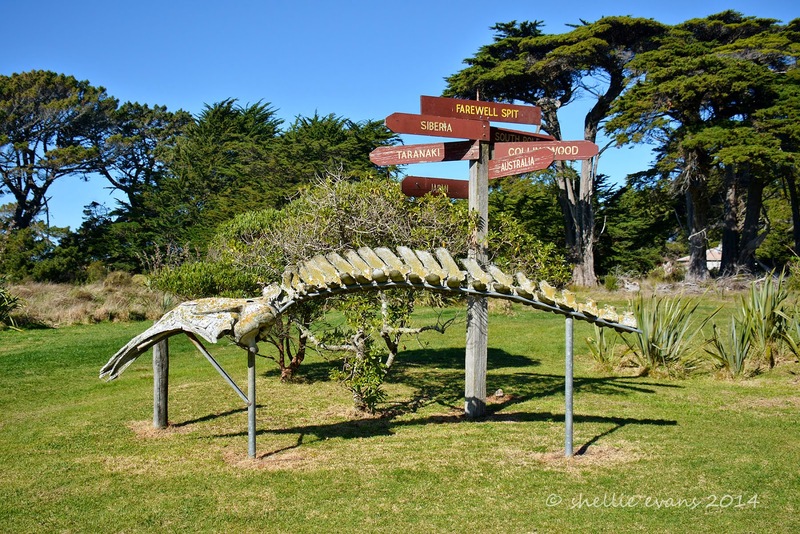 A whale skeleton, a reminder of the mass strandings that happen on the Spit, sits below a world sign post, without the distances. Before the lighthouse was built, many ships had been wrecked upon the spit; it had been feared by mariners for years. 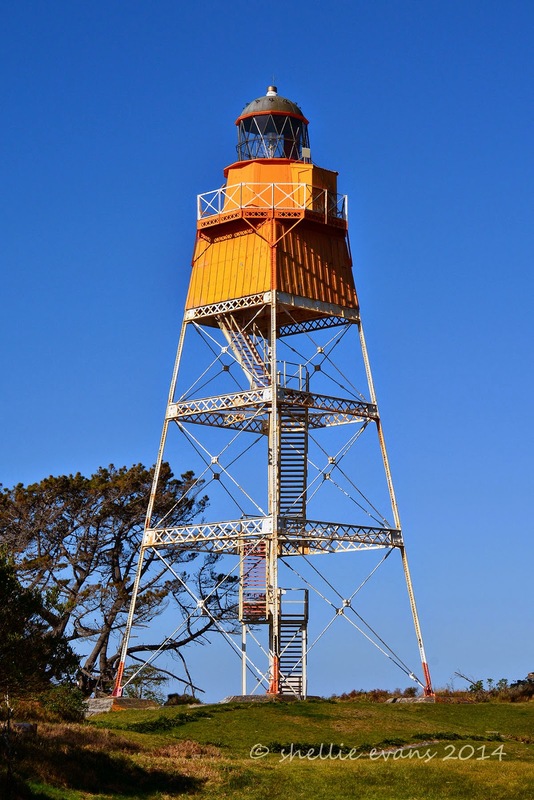 Construction of the light station at the end of the spit began in 1869. In 1891 it was found that the hardwood used for the tower was rapidly decaying because of the weather and abrasive sand. 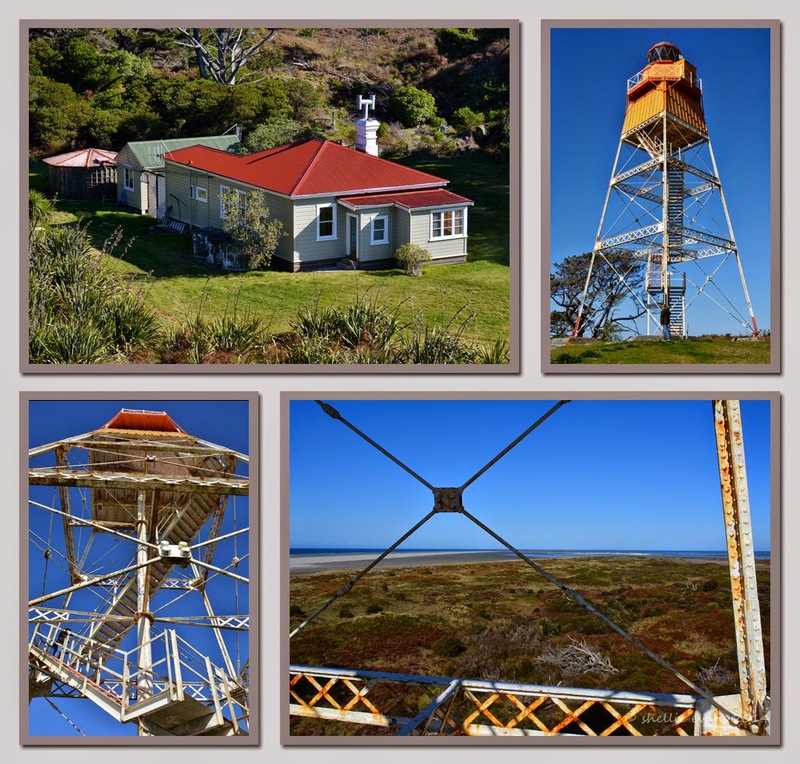 The tower was replaced with a steel latticework construction, the only one of it’s type in NZ. The new light was ready in January 1897. Farewell Spit was converted from oil to diesel-generated electricity in the 1930s. It was connected to mains electricity in the 1960s. The station was automated and the last keepers were withdrawn in 1984. 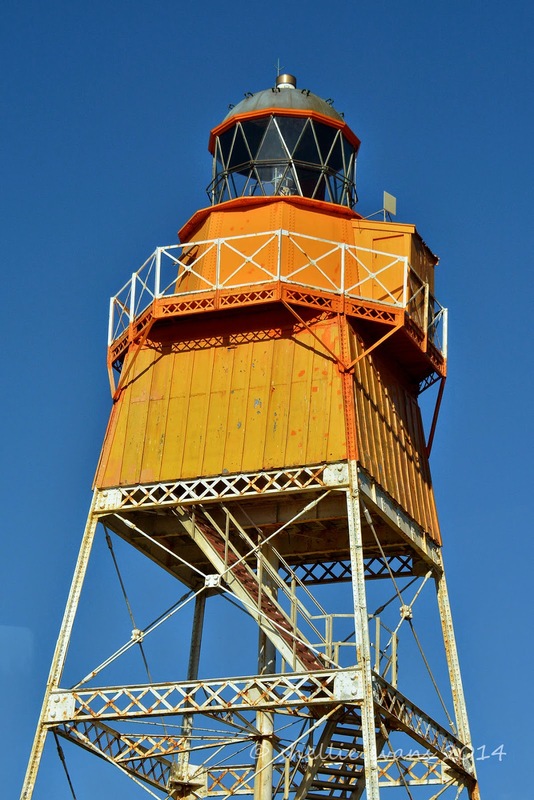 The original light was replaced in September 1999 with a modern rotation beacon, illuminated by a 50 watt tungsten halogen bulb. 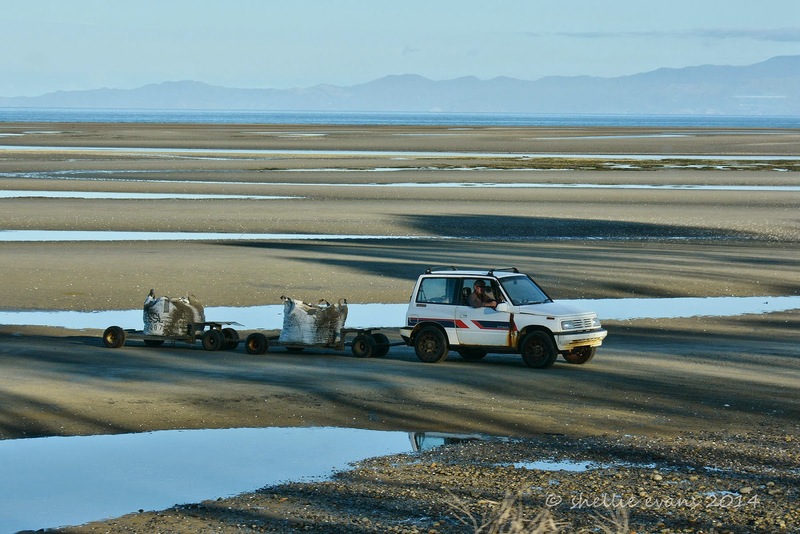 Farewell Spit was not a popular station among keepers because the site was completely bare of vegetation and sand got into everything. Keepers had the never ending job of shovelling sand away from their cottages. The first attempts to grow any kind of vegetation proved unsuccessful. Just before the turn of the century, a keeper organised loads of soil to be brought to the station with the mail. 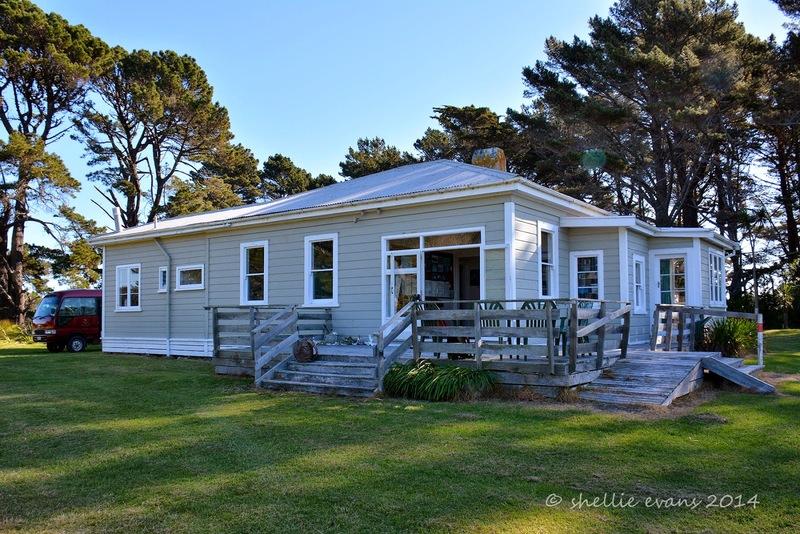 He planted a windbreak of macrocarpa pines to protect the station from the sand. As the pines grew, this windbreak became a well known landmark for passing ships. 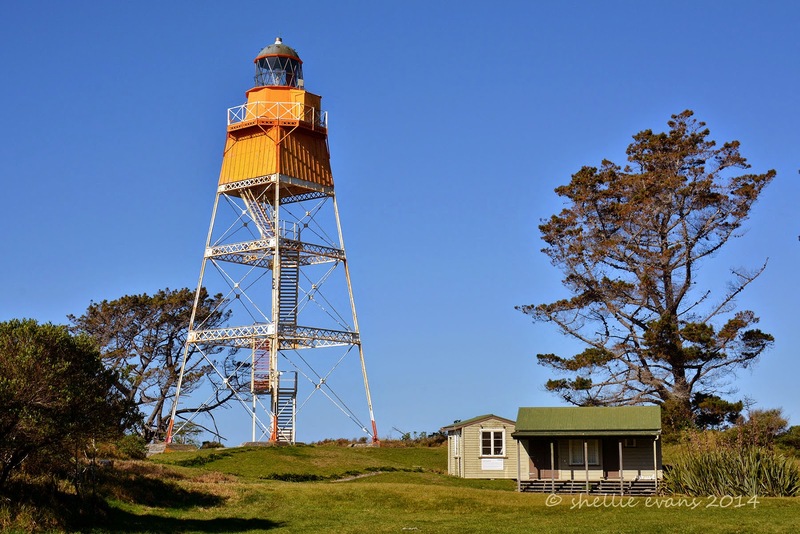 It was made very clear to the keepers that the diesel-generated electricity installed in the 1930s was strictly for the lighthouse, and not for domestic purposes. In 1957 the generators were finally allowed to be used one day a week for washing and to run the radio for the children's correspondence school. We were all a bit naughty, we shouldn’t have climbed the lighthouse stairway, a sign board blocked the way at the base, but we had a vote amongst ourselves and decided that we couldn’t come this far and not climb it to check out the view. And John had told us that he would be looking the other way back at the house. So it was a quick climb up to the 3rd landing, a few clicks and a hasty retreat. A couple of large gaps between the rises and a rotting board on one of the landings was obviously the reason that DOC were being extra cautious. Rounded up by John (an easy chore with just the six of us) and back in the bus, we hit the road (sand) again heading for home. This time higher up the beach and following the tire tracks of the DOC vehicles from this morning. They were pretty good too, following each other most of the way with just the occasional wobble. 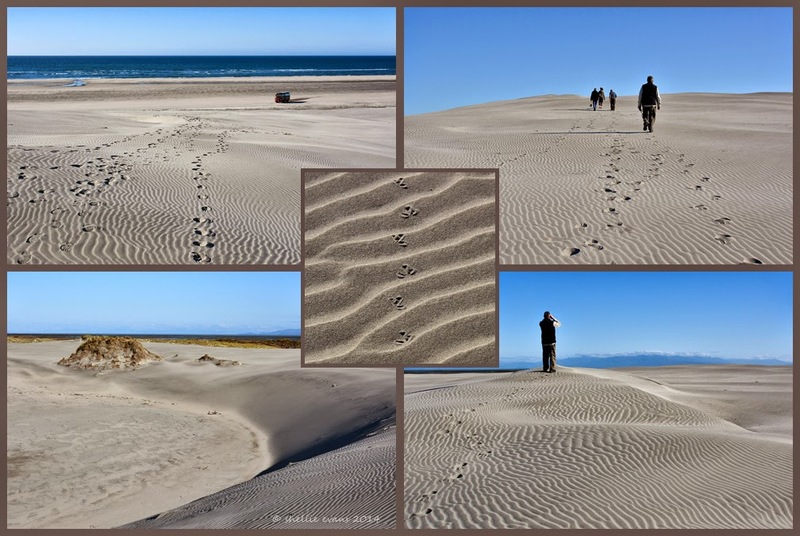 Our next stop was at the Spits “great dunes”, known as barchan dunes, they move in an easterly direction before the prevailing westerly wind, heading up the spit. That’s the front of one of them, quite a high & steep “cliff”, in the bottom left photo. I wished I’d had a piece of cardboard to toboggan down it but John told me that it wouldn’t work. The sand is quite “sticky”, kids that have tried it in the past haven’t moved more than a few feet (which means I probably wouldn’t move more than a few inches). And I suppose it would be a pity to mess up the silky smooth face. 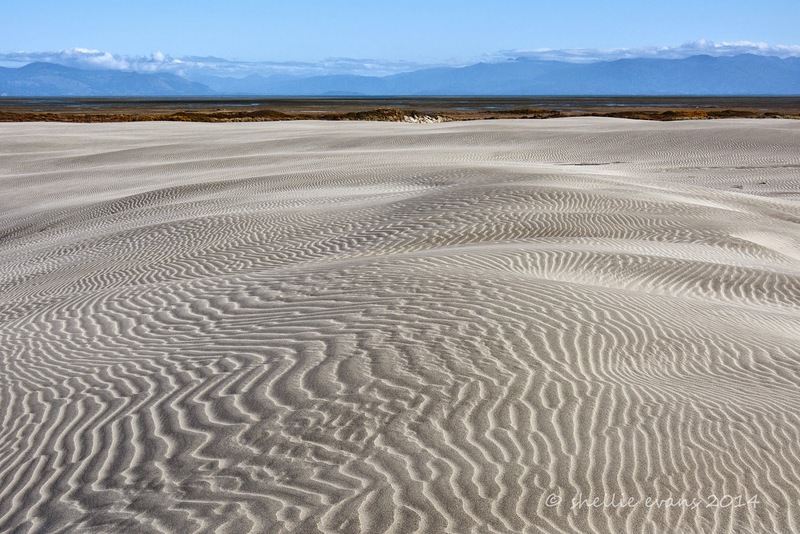 The views from the top of the dune are amazing, beautiful patterns ripple across the sand in every direction. In the distance we can see the tidal flats and beyond that Golden Bay & Separation Point. 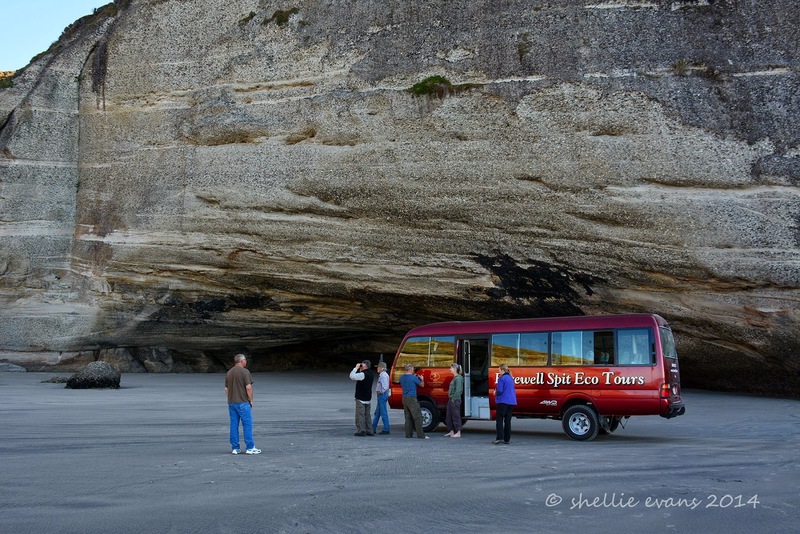 Out last stop is at Fossil Point, back past our entry point to the ocean side of the beach and just before Cape Farewell which we catch a glimpse of, this time from sea level. John won't show us where the fossils are, too many people have been helping themselves. 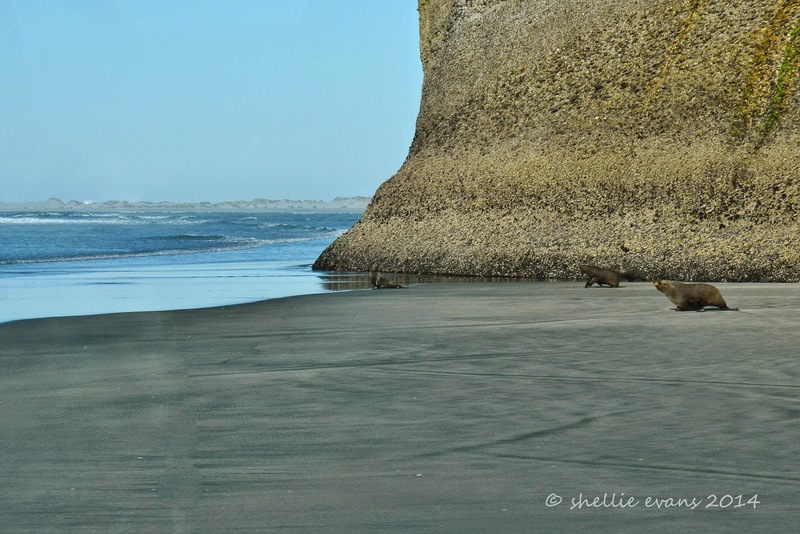 We stop beside two large sea caves where a couple of dozen seals, including pups, scatter, some running into the caves and others hiding behind a gap in the cliff. Maybe our vehicle looks like a large shiny orca on the hunt. When we get out of the bus they start to panic. They’re actually quite a distance away (in the cave in front of us out of the photo) but we can see that they’re getting agitated. 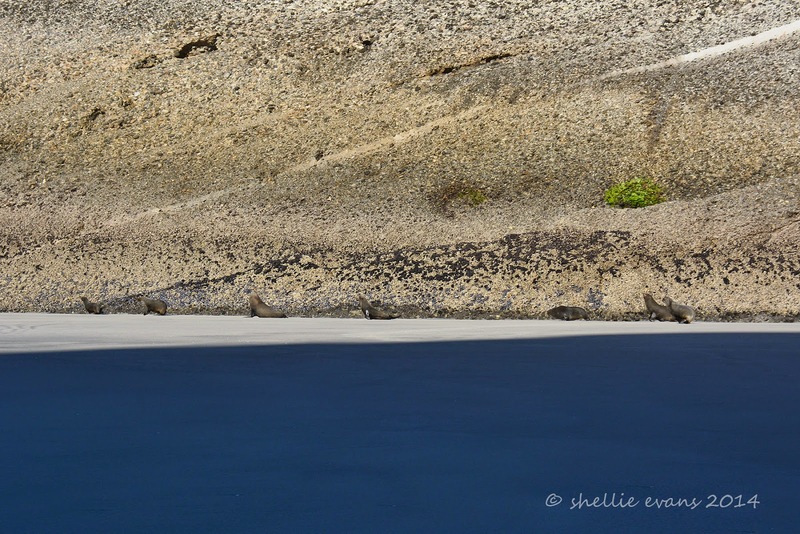 We’re not moving any closer but in the end they send some sort of signal to each other and then they’re off; the pups to the far back reaches of the cave and the adults racing in single file down the side of the cliff heading for the sea, which because of the tide, is quite a distance away (the blue section in the photos is the shade from the cliff behind us). They move quite quickly but must tire quickly too (dragging that amount of blubber around will do that to you), they stop to rest for a second or two which causes the ones behind to run up their bums. 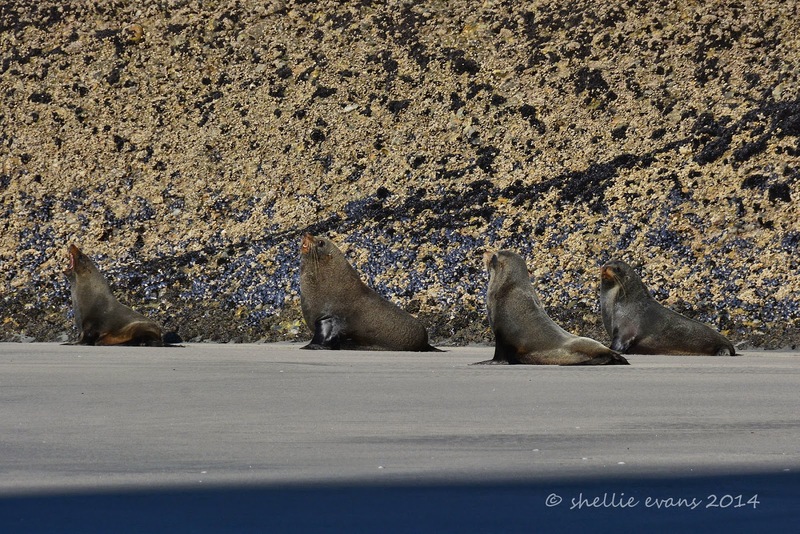 I felt sorry that we had disturbed them but on the other hand it was quite funny to watch. Just as they reach the breakers John lets out a yell to quickly board the bus. I wondered what was happening and then we see that the tide was fast approaching and cutting off our return route around the cliffs. We race for the gap cutting off some of the seals on the way. The shadows were getting long by the time we made it back onto the road home, it had been a long afternoon. Along the way we pass the rusty Suzuki jeep we’d seen the other day way out at the low tide line. Here it was towing it’s little trailer train with sacks full of clams! John was keen to pass on one more snippet of interesting information just before we arrived back in Collingwood. 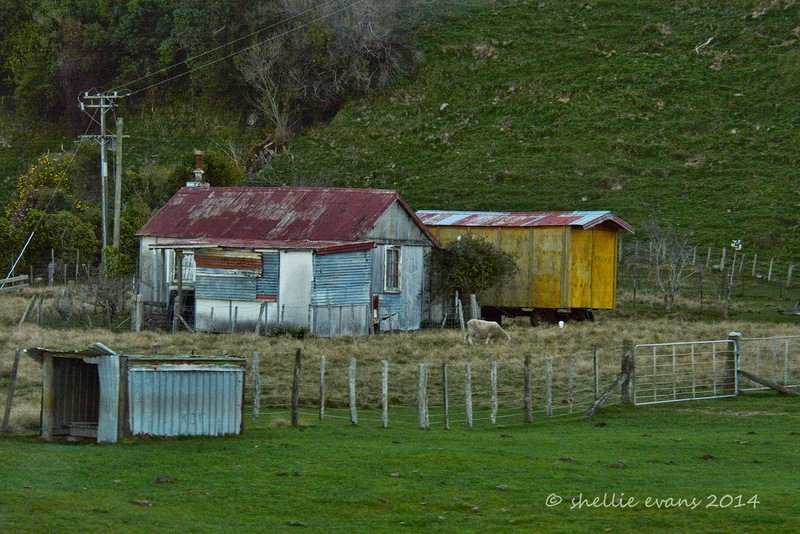 This old rustic shack in a paddock used to be the home of Barry Crump (a well known NZ author) and his wife Robyn, it was here that he wrote "A Good Keen Man". And with that the tour came to an end. We had a fantastic time and learnt so much and even though we initially thought a 6-7 hour tour was going to make it a very long day, the time just flew by. Big kudos must go to John our tour guide & driver who had an amazing amount of knowledge of the Spit and Golden Bay. He never missed a beat, imparting knowledge & telling stories non-stop from go to whoa. “It’s Just A Hill, Get Over It!"